Bishops in northeastern Italy will create a task force of psychiatrists and doctors to help priests deal with an increasing demand for exorcisms. According to the communiqué issued by bishops of the Triveneto region, a growing number of people are psychologically disturbed, feel victims of curses and other manifestations of what they believe is the work of the devil. 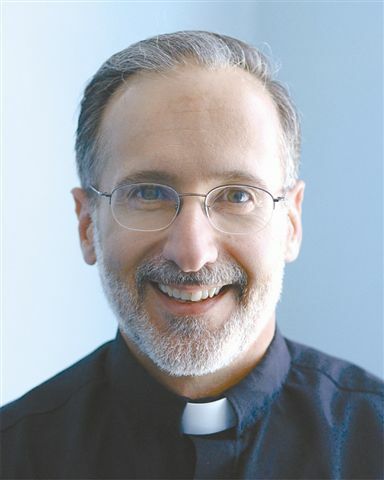 As the article indicates, not every request is legitimate; sometimes people with psychological or emotional disorders think they’re possessed or being harassed by the devil and they’re not (hence the bishops are assembling a task force of medical and mental health professionals to help evaluate individual cases). But the sheer volume of requests indicates that something strange is going on in this particular region of Italy. But is it really that much different from what’s going on in the rest of the world? In other words, they’re opening the door to demonic influences in their lives by dabbling in the occult. But that kind of thing is going on everywhere—even here in the United States! And, amazingly, highly educated people are very often involved in these activities! It’s not just the poor and uneducated who are seeking power and guidance from the world of spirits these days—it’s PhDs and CEOs as well! Perhaps that’s because the occult has been very cleverly “mainstreamed” in recent decades with books like the “Harry Potter” series, and with TV Programs like “Charmed,” and “Ghost Whisperer,” and “Crossing Over,” and “Medium”. National and local newspapers further the cause by publishing daily horoscopes, which many people read religiously. If only they read their Bibles as much! People have their palms read and their fortunes told at county fairs—and even at house parties! Teenagers and even pre-teens play with Ouija boards. Occult jewelry is also popular—like the so-called “Italian horn” which people of all different nationalities wear around their necks (sometimes right next to their crucifixes!). It’s ironic isn’t it? Our modern, supposedly scientific world is turning away from the worship of the one true God and moving little by little into occultism, while the ancient Magi that we heard about in today’s Gospel reading renounced their occultism and turned to the worship of the one true God, and of his Son, Jesus Christ! This last point is something that I learned recently from Dr. Scott Hahn of the Franciscan University of Steubenville in Ohio. On one of his tapes, Professor Hahn says that these Magi—these ancient star-gazers—were also in all likelihood "practitioners of the black arts". In other words, they were into the occult—big time! He bases that assertion on the 3 gifts they brought to Jesus: gold, frankincense and myrrh. According to Dr. Hahn, these items were some of the “tools of the trade,” so to speak, in the ancient world. People who were into the occult back then frequently used gold, frankincense and myrrh in their secret rituals. But the key point here is that the Magi presented these items to the newborn King in the manger. They laid them down in the presence of the Son of God—which meant that they were implicitly renouncing them! 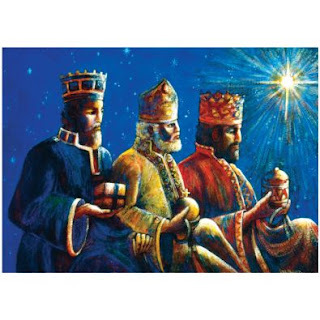 So these Magi knew that if they intended to submit themselves to the infant King of the Jews and honor him properly, they would have to renounce their past involvement with these occult activities that the Jewish religion condemned. And so do we—lest we open the door to spiritual powers beyond our control. Let’s learn a lesson from what’s going on right now in northern Italy. The best way, of course, for Catholics to renounce past occult practices is by bringing them into the confessional. Confessing them in the sacrament of Reconciliation normally breaks any hold they might have on us. It’s doing explicitly what the Magi did implicitly when they gave their 3 gifts to the Christ child. Through the intercession of St. Michael the Archangel—who is our great defender and helper against the devil; through his intercession may all those who need to hear this message today hear it, take it to heart—and then ACT upon it as soon as possible, by getting to Confession. 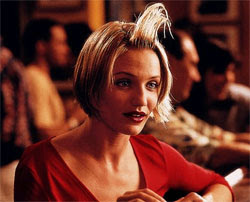 Cameron Diaz in the movie, "There's Something About Mary"
Several years ago, a movie came out with the title, “There’s Something About Mary”—and it had absolutely nothing to do with the Blessed Mother! However the title of the film does have an application to Our Lady, because it implies that Mary—the main character in the movie—has a certain effect on other people. And Mary, the Mother of God whom we honor in the Church on this New Year’s Day, definitely has a powerful effect on us and on other human beings. But, sadly, the effect is not always a positive one! And those of us who love her need to be aware of that! For example, there’s something about Mary that strikes fear—intense, overwhelming fear—in the hearts of some believers (usually Protestants). They’re afraid that if they honor the Blessed Mother as Catholics do, they’ll somehow be compromising their faith in Jesus. They’re afraid that if they pray to Mary as Catholics do, it will mean that they think she is equal to Jesus (which, of course, is not true: Jesus is God, Mary is a human person like us. She merely intercedes for us to her Son). They’re even afraid to call Mary “the Mother of God” because they think that behind this title is the belief that Mary actually existed before Jesus! So they will refer to her only as “the Mother of Jesus”. This, of course, is not what Catholics mean when they call Mary, “the Mother of God”. In fact, when we use that title we’re really saying more about Jesus than we are about Our Lady. Jesus was a divine person, not a human person—and that’s the key truth behind the title! Mary was the Mother of God—not in the sense that she existed before the Second Person of the Blessed Trinity existed! She was the Mother of God because she gave birth on Christmas Day to a divine person, not a human person—a divine person who had taken on a human nature in her womb 9 months earlier. There’s something about Mary that obviously also causes confusion in the minds of some people—believers and non-believers alike. For example, if being “saved” means “being saved from sin,” how could Mary have been saved by her Son since she was also sinless? Many people are confused about that. Why would Mary have gotten married if she intended to be faithful to a vow of virginity for her entire life? Why do people pray to Mary if she’s not God? Where are the Immaculate Conception and Assumption found in the Bible? I have known several Christians who have hesitated to join the Catholic Church because of their confusion about Mary’s identity, her role in our lives, and her role in salvation history. There’s also something about Mary, sad to say, that causes hatred to well up inside certain men and women. That may be hard for some of us to believe—because we know that Mary loves everyone without exception—but it’s true nonetheless. They hate Mary specifically because of what she stands for—and because of what she does not stand for. I don’t think it’s a coincidence that a lot of the blasphemous art that’s been produced in recent years has involved our Blessed Mother (like the portrait of Mary in the Brooklyn Museum of Art several years ago that had elephant dung all over it). They don’t like Mary because she stands for chastity and purity of mind and body—and that’s definitely not what they’re interested in. So they lash out at her in museums, and in books, and on TV shows (like South Park), and in gay pride parades. Mary also stands for liberation—true liberation (which is liberation from sin!). And so many women in the so-called women’s movement, who are filled with intense hatred for men, also detest Mary! They hate her first of all because she loves everyone—including those of the male gender! They also hate her because she reminds them that in their quest for justice and freedom, they’ve actually become slaves—slaves to their hatred. And they hate her because she’s not a political tool that they can use to advance their cause. Those, unfortunately, are some of the negative effects Mary has on people in our modern world. But, praise God, she also has a powerful, positive impact on the lives of millions—inspiring them to live their faith and persevere in it. C.S. Lewis used to say that it’s impossible to remain neutral about Jesus. Ultimately, you’ll either come to conclusion that our Lord was exactly who he said he was—the eternal Son of the heavenly Father—or you’ll come to the conclusion that he was “a madman or something worse”. But, as I think I’ve made clear in this homily, it’s also impossible to remain neutral when it comes to the Blessed Mother. There’s something about Mary that either fills you with fear, confusion and hatred—or there’s something about her that fills you with courage, confidence, love and forgiveness. There’s something about Mary, in other words, that either repulses you or inspires you. May the Lord help each and every one of us to be deeply inspired by Mary—always!